Humorously enough — albeit with an element of truth — it has been argued for a while that Novell is Microsoft’s Linux division in the sense that it builds, designs, and distributes GNU/Linux in a way that is most convenient to Microsoft. 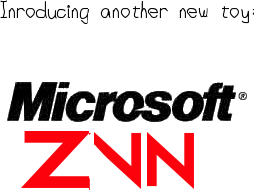 It also ‘extends’ GNU/Linux distributions using technologies like Silverlight and OOXML, but that’s another story about ways in which Novell serves and promotes Microsoft agenda. ”At the moment, for instance, Novell characterises Microsoft not only as benign, but also generous, according to the headline of one report from the British press.“What has become more worrisome is Novell’s relentless attempts to glorify not only Novell-type deals with Microsoft, but Microsoft’s behavior as well. At the moment, for instance, Novell characterises Microsoft not only as benign, but also generous, according to the headline of one report from the British press. There is no generosity here. Microsoft established a system where it can tax Linux per sale. Novell pays Microsoft based on how much SUSE it sells while the company crumbles. Essentially, Microsoft reinvents the Linux sales model with Novell’s help. Do remember that Ron Hovsepian openly complained about Microsoft’s dirty tricks just shortly before the big deal was announced. Why the sudden 180-degrees turn? It would probably be foolish to quote articles which merely echo Novell executives. The Register’s take is a better one. Novell wants you to know that selling its soul to Steve Ballmer was a really good idea. On the last day of 2007, two separate Novell execs tossed up blog posts congratulating themselves for agreeing to that “interoperability partnership” with Microsoft, a year-old deal intent on forcing an unholy relationship between Linux and Windows. How about the following? Mind the image which says “Microvell” in a Web site as reputable as NetworkWorld.com. Our little game with trademarks isn’t so wild after all, is it? Even with that “sugar” from Microsoft, Novell didn’t end up profitable for the year. I don’t know how much of the $355.6m payment was recognized as 07 revenue but Novell still ended fiscal 07 with a $44.5 million loss.